Yellow for spring? How novel. On paper, it seems like a pretty obvious color for this time of year, but after all the blacks and browns I’ve been wearing this winter, it feels fresh and new to me. My mom had this fabulous blazer hanging in her closet for years and I immediately thought of it when I started searching for yellow pieces for spring. The structured shoulder and black trim totally fit the bill for the ’80s blazer trend right now. 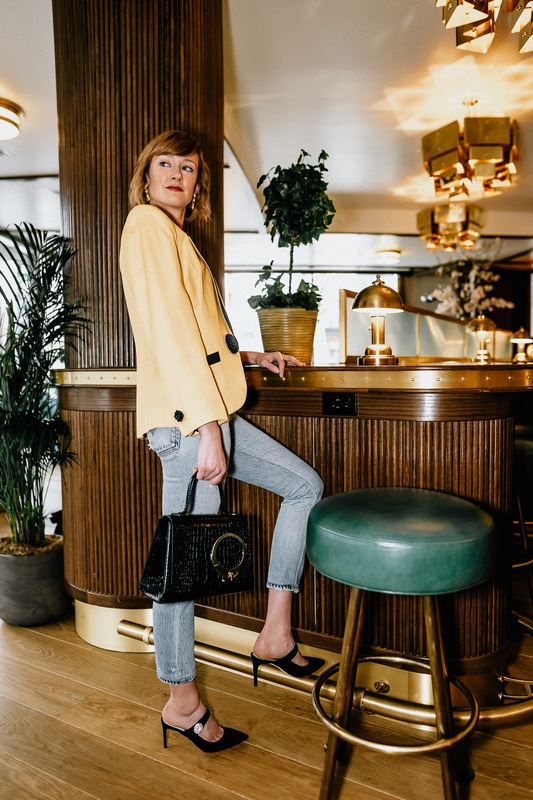 You can easily make a vintage piece like this look modern by styling it with laid back jeans and a chic pair of heels like these sparkly mary janes from Bruno Magli. 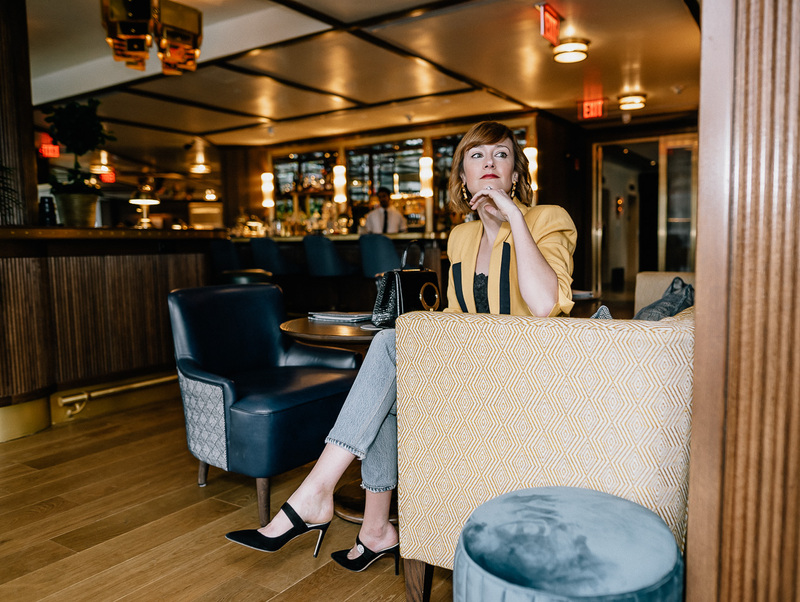 If you’re looking to score a similar vintage blazer, I found a few great ones here, here, and here. 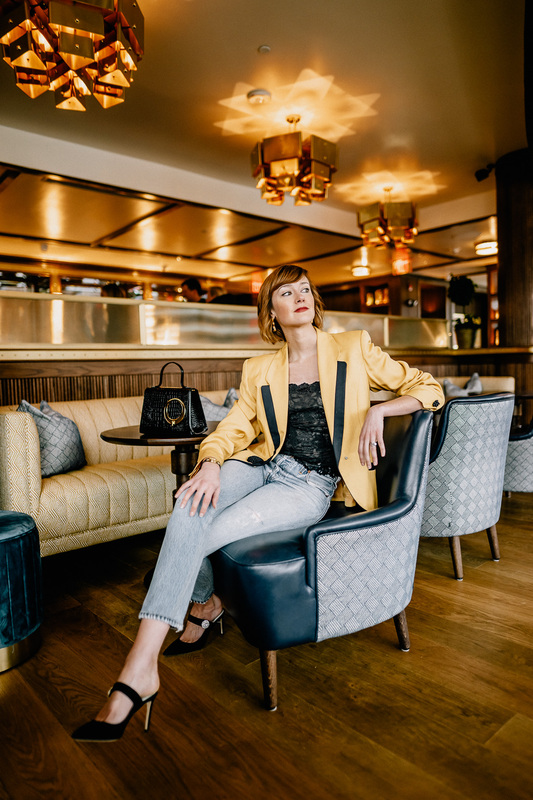 The yellow trend is a great one to thrift so keep your eyes peeled for loose button downs you can tuck into high-waisted pants or knot at the waist, sweet cropped sweaters and cardigans, and of course oversized blazers! Photos shot by Pablo Raya at Doyle Bar. Love that blazer! Looks so good with the jeans! I’ve been on the hunt for a yellow blazer for years now… I’ve yet to find my own. That blazer is beautiful. Love the shoes too. Head to toe, perfect OOTD! Yellow is such a great color to wear during spring, I totally love it! Your outfit is so gorgeous and sophisticated, babe. Love the set of photos! My love of yellow has waxed and waned over the years. I went from having a closet full of everything from blazers to bags, to having one lone dress I now haven’t worn in years and yet still hold on to. Maybe it’s time for a fresh reintroduction, as you are making yellow look so chic.